How does your work as a hydrologist tie into wildlife conservation? As a hydrologist, I am mainly responsible for water resources management which involves collecting, collating, and storing hydrological data which is used to assess and monitor water use. Ultimately the goal is to conserve water sources and riverine areas, ensuring water quality is high and access to water sources is equitable for all users in the catchment area of a particular water source. Wildlife conservation means protecting wild plant and animal species as well as their habitats. Southern Tanzania is home to a connected ecosystem including the Kilombero Nature Reserve, Udzungwa National Park, Selous Game Reserve, and the Kilombero Valley Ramsar site — a wetland designated as internationally important. Deforestation, poor irrigation infrastructures, inefficient water use, cultivation along river banks, and excess abstraction of water for irrigation has decreased flow to the Great Ruaha River, and also reduced the quality of the water reaching downstream users. In Mbeya, we had to restore the land and streams that feed rainfall into the river — known in hydrological terms as a sub-catchment — because the reduction of water had negative impacts on the entire ecosystem of the Ruaha National Park. 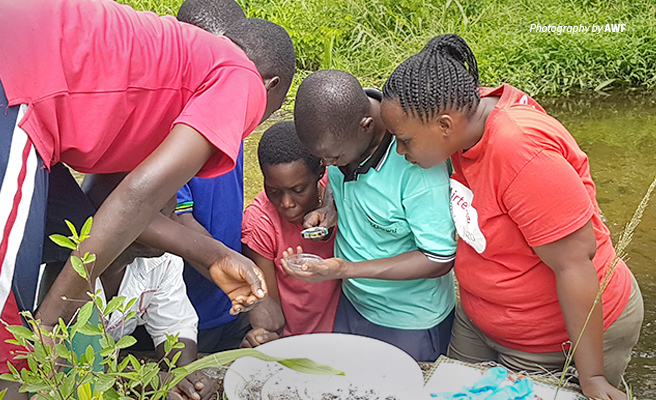 In both Mbeya and Kilombero, AWF has helped train water-users to plant water-friendly trees and provided them with skills and tools to monitor the health of their river. Our team produces hydrological analyses and disseminates water-related information to different stakeholders so communities can see the impact of their water use. What is the state of water on the continent of Africa? Africa has abundant water resources, but these are unequally distributed across the continent. Water availability between sub-regions varies significantly — around 50 percent of Africa’s total surface water is focused solely within the Congo River Basin, and 75 percent of total water resources are concentrated in just eight major river basins. Across the continent, water withdrawal is mainly for agriculture, domestic use, and industry. The volume of water used is relatively low, estimated to be only 3.8 percent of the total annual renewable water resources, but many countries are racing toward the physical limits of available fresh water. In other countries, the rapid population growth and the expansion of urban settlements, industry and commercialized agriculture, is adding extra pressure on water resources that are also degrading in quality. At the same time, rainfall is becoming increasingly unreliable, and climate change is likely to increase this variability further. These shifts will make it tougher for rural communities to access a reliable source of water. What are the biggest water challenges facing communities in Southern Tanzania? The Rufiji Basin covers 183,791 sq. kilometers, roughly 20 percent of Tanzania, making it the largest basin in the country. It is made up of four major rivers — the Great Ruaha, Kilombero, Luwegu, and Rufiji. The Kilombero sub-basin contributes over 62 percent of the total flow to the Rufiji River. Tanzania’s economic development depends on this basin as it supports an estimated 1.4 million people and wildlife populations, as well as hydro-electric power production, agriculture, mining, forestry, livestock keeping, and commercial fishing. Pressure on land and water resources is intensifying, especially in recent years as human population growth and settlement rise across the Rufiji Basin. The Tanzania National Water Policy recognizes the crucial role of rural communities as end-users in maintaining both the ecological health and economic viability of the rivers and the basin at large. Since 2002, the policy provides for the formation of water-user associations as a formally recognized governance body responsible for the sound management of water resources. However, few water-user associations have been formed across the nine basins in the country. Those that are have been established face financial constraints and have limited access to technical resources that would enable their efficient performance in managing rivers. Their limited ability to monitor the quality of the water over time makes it difficult for them to make long-term decisions protect their natural assets rather than continuing to degrade them. How does AWF encourage responsible use of water resources? One of the first steps is to improve community engagement through the formation of water-user associations. 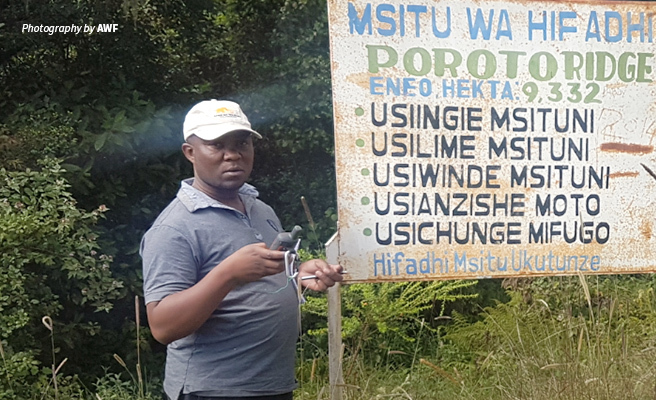 With support from the Rufiji Water Basin Office and the University of Dar es Salaam, we selected three sub-catchments, namely the Upper Mngeta, Lower Mngeta, and Mkoji, and aided the villagers in the process of setting up a water-user association. This was a very important component of IUCN’s SUSTAIN-Africa program as it provided a framework to engage communities and other stakeholders in water resource management. We focused on improving their ability to monitor the river cost-effectively and improve accountability. We organized villagers and other stakeholders and helped them form the Kilombero Catchment Committee, and they developed a catchment management plan. Basin staff also needed training on how to streamline water allocation, so AWF trained them on the application of the Nile Basin Decision Support System. Improving water-use efficiency is also a priority in Kilombero due to the volume of water diverted for agriculture. In addition to other simple tools for water-users, we introduced iMomo, a non-traditional water monitoring technology that allowed irrigators to estimate the amount of water they are using for their farms. Why is it so important for communities to monitor their water resources? 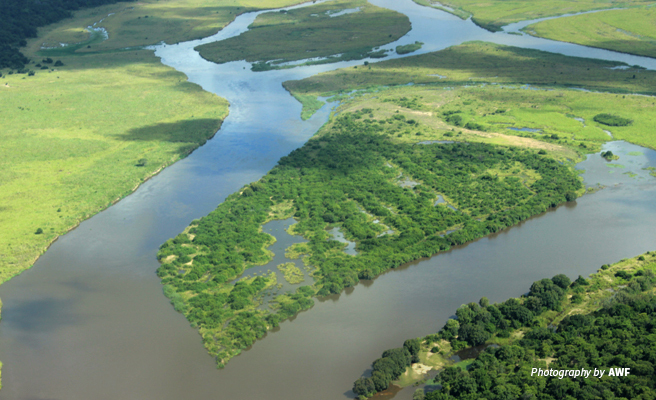 The Rufiji Basin is expansive, remote, and inaccessible in some parts, which increases the cost of monitoring river health. As end-users, communities need to have access to a database of information at the local level so they can make better decisions for long-term development. For a large, resource-rich and complex basin like Rufiji to be sustainably utilized, strategic monitoring of its rivers must be in place. However, the monitoring of water quality tends to be done primarily by specialists. The prohibitive cost and the lack of easily accessible technology for the less technical hands mean that communities and local stakeholders of water resources were not actively engaged in water quality management. To shift this dynamic, we introduced a simple, effective, and low-cost biological monitoring tool known as miniSASS adopted from South Africa. It allows water-users to assess the health of the river by checking the composition of macroinvertebrates that are sensitive to river disturbances. For example, if they find few crabs, snails, dragonflies or stoneflies in the water sample, their river will be flagged for its low-health status. Done on a routine basis, the assessments contribute to a database of indicators that help point to disturbances upstream and determine whether further complex analyses are required. This will support long-term catchment and river management decisions. 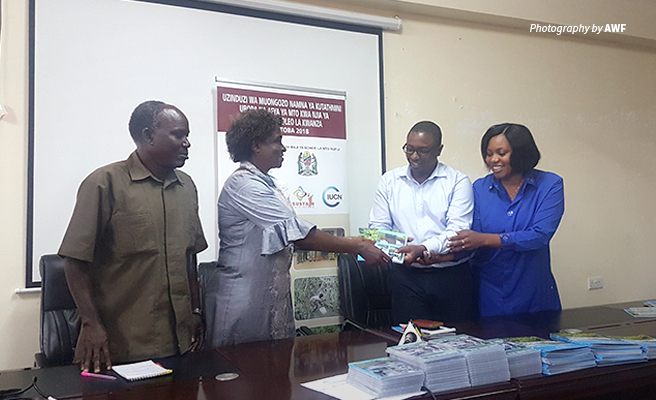 In 2018, we released a version suitable for Tanzania’s basins called TARISSfupi and provided learning materials such as DVDs, training manuals and posters outlining procedures and methodologies. How has this biomonitoring tool improved conservation efforts in the landscape? Water-user associations are actively monitoring river health and initiating restorative actions. In some cases, drastic changes in water quality were observed, signaling the need for detailed chemical analysis by the Rufiji Basin Water Board. In Lower Mngeta, low water quality prompted the water-user association to investigate the source of the problem. It turned out that agricultural activities upstream were increasing sedimentation and polluting the river. 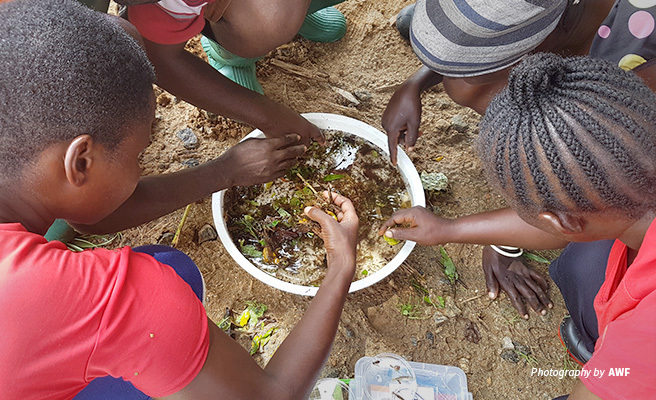 Working with upstream communities and the Tanzania Forest Conservation Group, the water-user association initiated awareness-building activities with communities farming along river banks, encouraging them to plant trees instead to reduce erosion. Local government authorities were also engaged to enforce land use plans and policies on buffer zones. Why is good quality water as important as the availability of water? Quality water is critical for household, agricultural, and even industrial usage. It is even more critical for the environmental wellbeing of landscapes. Low-quality water due to pollution can increase the cost of water with negative effects on human health, agricultural production, and other economic activities. The dangers posed by degraded water sources reach all forms of life in the ecosystem, including keystone wildlife species. As climate change amplifies these risks day by day, the protection of water sources is all the more important.